Activists of Trinamool Congress (TMC) and Bharatiya Janata Party (BJP) engaged in a clash with each other in presence of police force at Shibpur area in Kolkata's adjoining Howrah city on Saturday late afternoon, reports said. 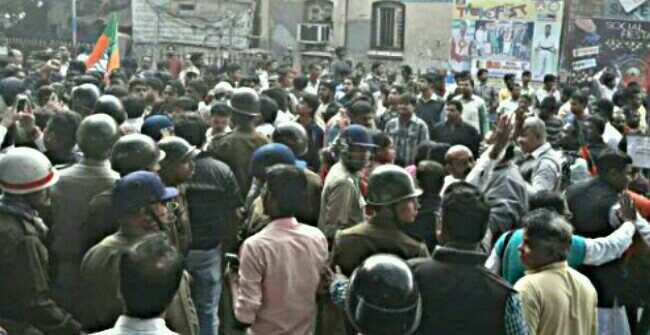 According to reports, a large number of BJP supporters took part in an announced deputation programme and gheraoed Shibpur Police Station in the afternoon. Local BJP leaders alleged that local TMC activists suddenly attacked them and had started brick, stone and glass-made bottle batting, aiming at BJP supporters, in the presence of a heavy police force. BJP state president Dilip Ghosh claimed that several activists of his party were injured during the clash. Later a huge police force along with Rapid Action Force (RAF) and combat force rushed to the scene and security personnel lobbed tear shells and restored to lathicharge to bring the situation under control. BJP leaders alleged that few of their activists have been detained by the local police while none from the state's ruling party has been arrested so far. However, the situation at Shibpur is completely under control now and a heavy police force have been deployed there to avoid further untoward situation. Local TMC leaders claimed that none of their party was involved in the incident. Meanwhile, Mayor of CPI-M ruled Siliguri Municipal Corporation, Ashok Bhattacharya, has been admitted to a local hospital in Siliguri after allegedly being attacked by Trinamool Congress (TMC) councilors during a board meeting at municipality office on Saturday, according to reports. Local TMC leader and opposition leader of Siliguri Municipal Corporation, Ranjan Sarkar, claimed that they did not assault Mayor Ashok Bhattacharya.